Instant pot duo plus is undoubtedly one of the best pressure cooker models currently on market. Equipped with state-of-the-art safety technologies and food-safe materials, pressure cookers of this model are very safe to use. Besides, their efficiency and diverse functions place them at the top of the game. Let’s have a look at review of the four best instant pots of this model. 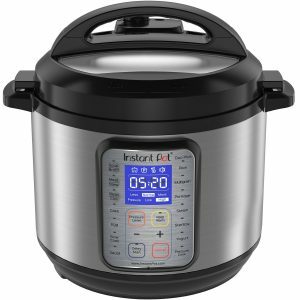 Instant Pot_Duo Plus 3 quart nine-in-one comes as a single set containing a whopping nine kitchen appliances including a pressure cooker, sterilizer , rice cooker, warmer, yoghurt maker, sauté, warmer, slow cooker as well as a steamer. Its exteriors are made of brushed stainless steel material which is resistant to fingerprints. The pressure cooker is also easy to handle as it comes with a lid holder for both left-handed and right-handed users. The interior pot is free of chemical coats and instead features food grade 304 (18/8) stainless steel. Besides, the pot has marking indicating the where its half and two-thirds capacities for safety while you are cooking with it. The pressure cooker is equipped with a wide range of safety features including a pressure regulator for keeping the cooking pressure within the safety limit. It also has an anti-blockage vent which prevents the vents from blockage resulting from food debris. The cooker is also fitted with a safety lid lock for preventing it from opening accidentally when it has much pressure. When the lid isn’t positioned properly while you are cooking, there’s a sensor that will detect the hazard and bring it to your attention. You can use this cooker to cook delicate foods and those that require much cooking time as it has low pressure as well as high-pressure settings. 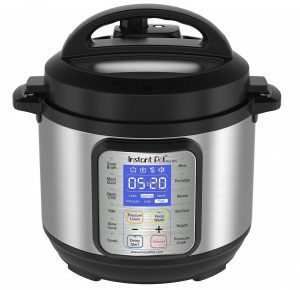 Weakness: Although Instant Pot_Duo Plus 3 quart 9-in-1 has all those amazing features, it has one set back; there has been several complains about the silicon ring that seals it. The ring in the lid is likely to pick up and retain flavors and scents from the food you are cooking. The cooker is a worthy buy for various kitchen uses and is safe to use. However, the picking up of scents and favors by the lid’s silicon ring may be a turnoff if you are oversensitive to smells and tastes. 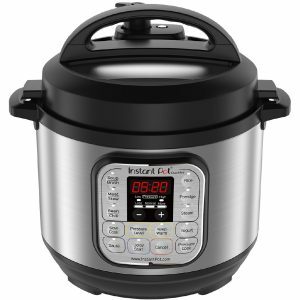 Instant Pot_Duo Plus 60 9 in 1, 6 Quart comes as a single set containing 9 major kitchen appliances consisting of a pressure cooker, sterilizer, rice cooker, egg cooker, slow cooker, sauté, warmer, yogurt maker as well as a steamer. With this cooker, you can save up to 70% of your cooking time as it has 15 preset cooking programs which are controlled by its microprocessor. All the areas of the cooker that come to contact with your food, for instance, the lid, steam rack and the inner pot are made of stainless steel of grade 304 (18/8), a food-safe material. Besides, the cleaning of all these components is easy besides being dishwasher safe. It comes with an array of accessories including a serving spoon, steam rack, measuring cup as well as a recipe book with more than 300 instant pot_duo plus recipes. The cooker features ten verified safety mechanisms as well as patented technologies for ultimate peace of mind while you are using it. They include a pressure regulator, safety lid lock, a sensor which alerts you when the cooker’s lid isn’t properly positioned, a fuse regulating electrical current temperature fuse as well as smart detection of a leaking lid. Weakness: The seal of this cooker absorbs much odor from savory foods. The smell compromises with the quality of the consecutive sweet food. 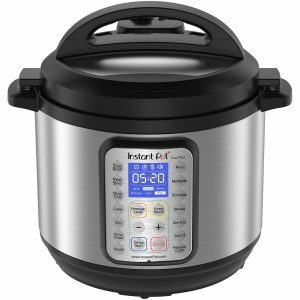 Everything about this Instant Pot_Duo Plus is epic only that you may need to buy extra seals separately to present your sweet food from being compromised by the savory odor picked by its out-of-the-box seal from other foods. This Instant Pot_Duo Plus is a one set of nine major kitchen appliances comprising of a pressure cooker, rice cooker, yoghurt maker, steamer egg cooker, sterilizer, sauté, slow cooker as well as a warmer. With this instant pot, you’ll save 70% of the time you would have otherwise required to prepare different meals using independent kitchen devices. All the instant pot’s areas that touché your food are made of stainless steel of food grade 304 (18/8) for food safety. The stainless steel components include the lid, the steam rack as well as the inner pot. The stainless material also makes these components to remain fingerprint-free and safe for the dishwasher. You can safely and comfortably handle this cooker whether you are right-handed or left-handed since it has a lid holder tailored for both left and right-handed users. The pressure cooker has both low pressure and high-pressure settings; use low pressure to cook delicate food and high pressure for the hard foods that require much heat. The 8-quart pressure cooker comes with an Instant Pot_Duo Plus cookbook with more than 300 recipes and is equipped with 10 proven safety mechanisms and technologies which are certified by Underwriters Laboratories (UL). The safety mechanisms consist of a pressure regulator, safety lid lock, a fuse for regulating internal temperature and electrical current, an intuitive leaky lead sensor and an anti-blockage vent. Weakness: Despite thorough cleaning, you may find the silicone gasket holds of the Instant Pot_Duo Plus still holding some odors from the last meal, especially if it was spiced. To counteract this problem, you may be prompted to buy another seal for covering it when cooking sweet meals without unwanted odors. The pressure cooker is large enough to prepare meals for large family and is ideal for quick and efficient meal preparation. Besides, it is very safe to use. However, the picking up of smells by its lid is a turnoff but you can sort out the issue by buying another lid which you’ll be using when you don’t want your food to be contaminated by unwanted smells. This pressure cooker is a relatively compact set that is ideal for preparing meals for small families. It comes as a combination of seven common kitchen appliances including a pressure cooker, a slow cooker, a warmer, a rice cooker a sauté, a steamer as well as a sauté. With the rice cooker able to cook 6 cups of uncooked rice, it will be of great help when you want to enjoy a nice meal with several buddies or family members without raiding a finger during your outdoor leisure activities like camping and mountain hiking. The set is equipped with 11 smart programs that have been set to cook particular foods appropriately. By just selecting a respective program, you can make yogurt, cook slowly or at high pressure, steam, or cook rice, porridge, meat or meat stew, broth or beans like a professional cook. The pressure cooker also has a delayed start of up to 24 hours and you can make your food stay warm in it by selecting ⁫‘keep warm’ to a maximum of 10 hours. Besides, the pressure cooker comes with several accessories including a cup for measuring rice, a steam rack, rice paddle, a recipe booklet with more than 300 recipes, a soup spoon as well as a condensation condenser. The inner pot doesn’t have chemical coating; instead, it is made of stainless steel of food grade 304 (18/8). Additionally, it features 10 safety mechanisms which eliminate lots of possibly dangerous common errors. The pressure has a small capacity that’s only enough to prepare meals for only a few people. Instant Pot Duo Mini 3 Quart 7-in-one is a safe and efficient pressure cooker suitable for small families. There you have it folks. All four electric cookers featured above have relatively same material & safety levels except there size. So go ahead and pick one according to your family size and thank us later.